I’m a big fan of hamburgers, if you haven’t noticed. When we went to San Diego, I tried for the first time In-N-Out Burger. The special sauce was addicting. The cute wax paper wrapper reminded me of the Shake Shack, but I trust that In-N-Out did the wax paper wrap first. So, how does In-N-Out Burger compare with the Shake Shack? Ah, the age old question. It’s nearly impossible to know for certain that one is better than the other because the burger joints are on opposite coasts. A five hour plane ride could ruin the important, delicious facets of either burger. As you can see in the link I shared above, the recipe is quite long. But that’s only because they urge you to create your own ground beef, a part of the recipe I did not follow. I simply bought some ground chuck from the supermarket and proceeded to step five. The recipe calls for squishy hamburger buns, but I opted for the potato buns that I bought from Whole Foods. 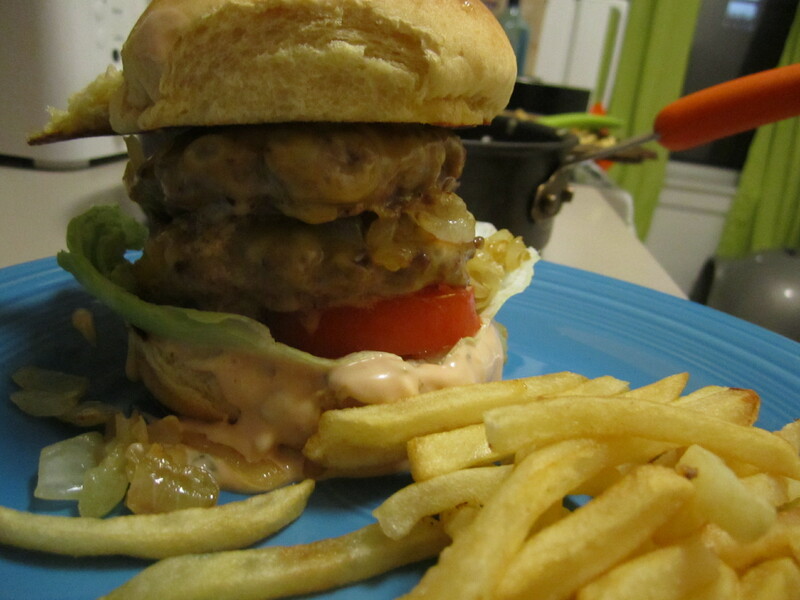 I made the onions according to plan and assembled the burger as recommended. My dining partner and I ended up eating only one patty of the sandwich. As you can see in the above picture, the sandwich was huge and unwieldy with two patties. He ate his second patty with a fork and knife, and I elected to toss mine. I served crisp, matchstick fries with the burgers. If Shake Shack doesn’t do it for you any more, I urge you to try making your own In-N-Out burgers. It’s fun and yields delicious output. How could you resist?